I was staying in Saint John NB Thursday evening. 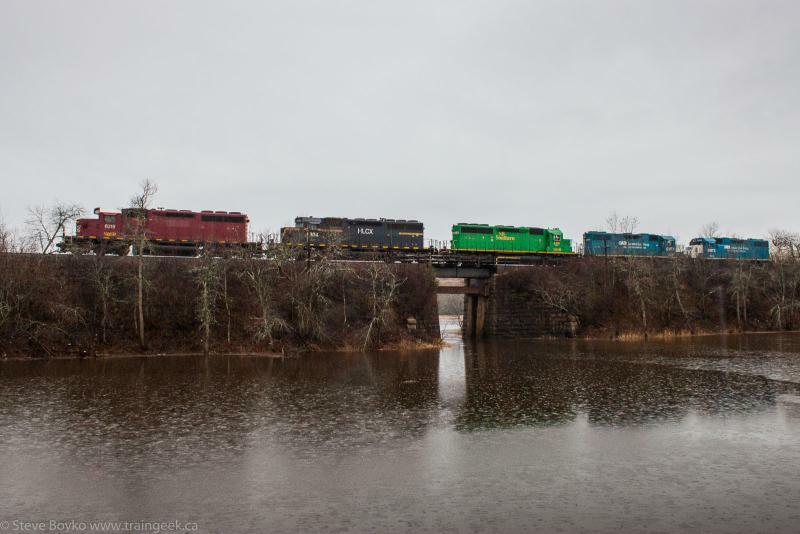 I awoke Friday morning (Dec 12) at 8 am and checked my email / Google+ / Facebook and found a post in the RailsNB Facebook group from Brian Barchard reporting an NBSR eastbound freight train through Harvey at 07:25. I did some mental calculations and figured they couldn't cover the 40+ miles to Welsford until 08:30 at the earliest. I grabbed a quick breakfast at the hotel and headed out. My intention was to follow the NB Southern line all the way until I stumbled across the train. 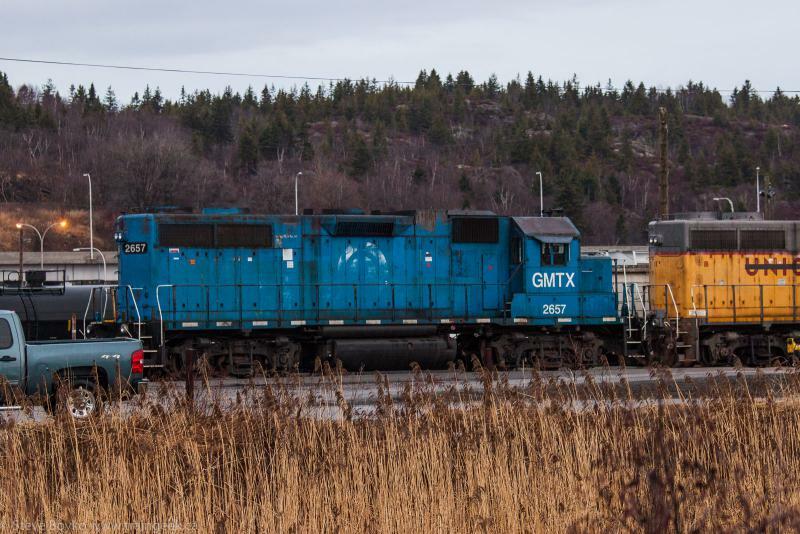 On my way out of Saint John I saw these two units at Island Yard.. 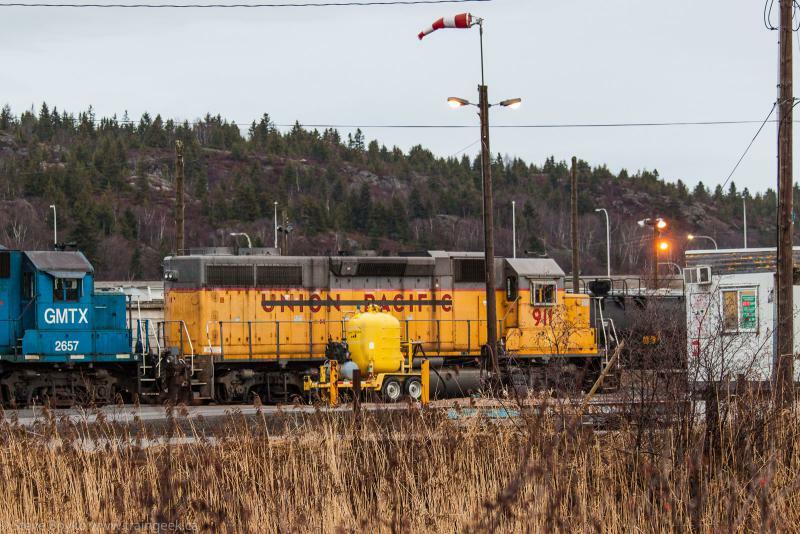 I passed the Ponderosa Yard at Dever Road in Saint John but nothing was going on. Onwards! I passed through foggy Grand Bay-Westfield without any sign of trains. As I approached Welsford I heard the EOT squawk* on my scanner just as I came to Aikins Lane/Sand Hopper Road and saw white tank cars going east. Time to turn around! I decided to get them at Brittain Road first. I got there about 2 minutes ahead of the train. Looking at the bright(er) overcast sky and the dark ground, I set the exposure compensation on my camera to -2/3 of a stop. I do that in these situations to prevent the sky from blowing out when the camera meters the ground. I also had the shutter speed at 1/250s because of the low light. Normally I'd prefer 1/400 or faster but it wasn't possible given the available light. It turned out OK. 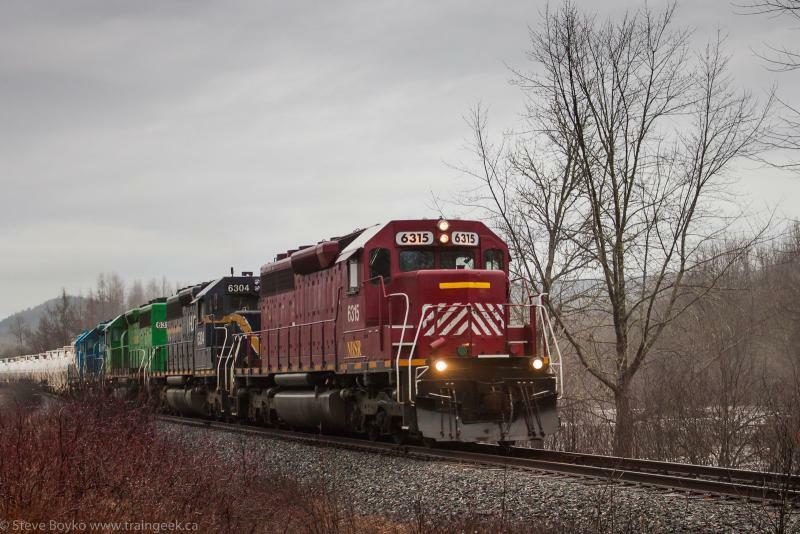 The consist was NBSR 6315, HLCX 6304, NBSR 6318, GMTX 2226 and GMTX 2233. Next I was determined to get the overhead shot at Westfield Beach. I parked at the mailboxes and ran like heck up the bridge to get into position. 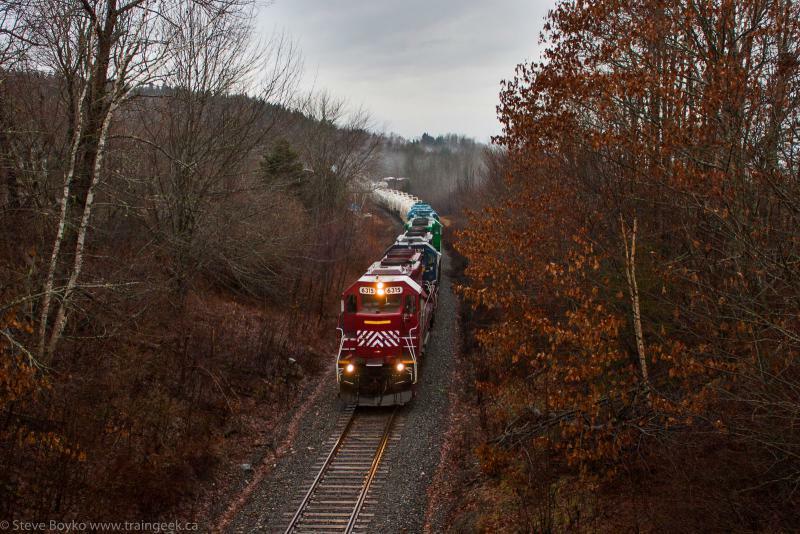 Seconds later the headlights were visible as the train came around the bend. I knew I would be playing catch up so I drove through Westfield-Grand Bay. I wanted the curve shot at Milligan Road and arrived just in time. 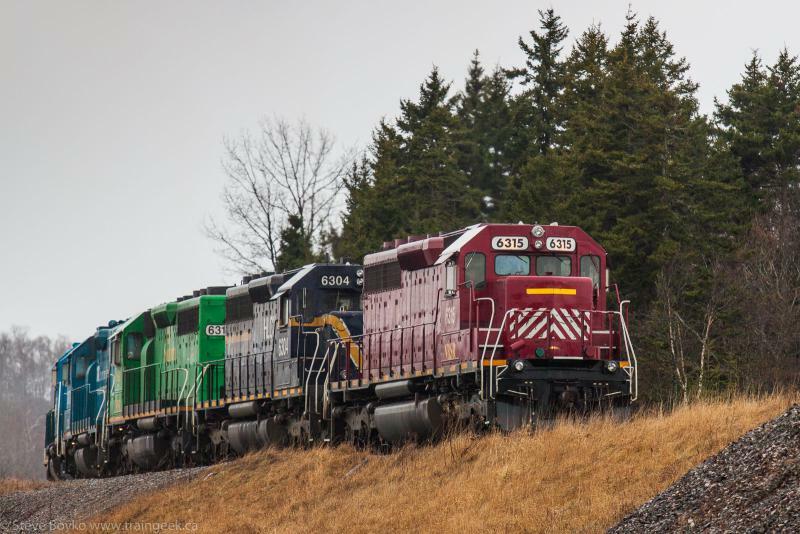 Part of railfanning is choosing your opportunities! 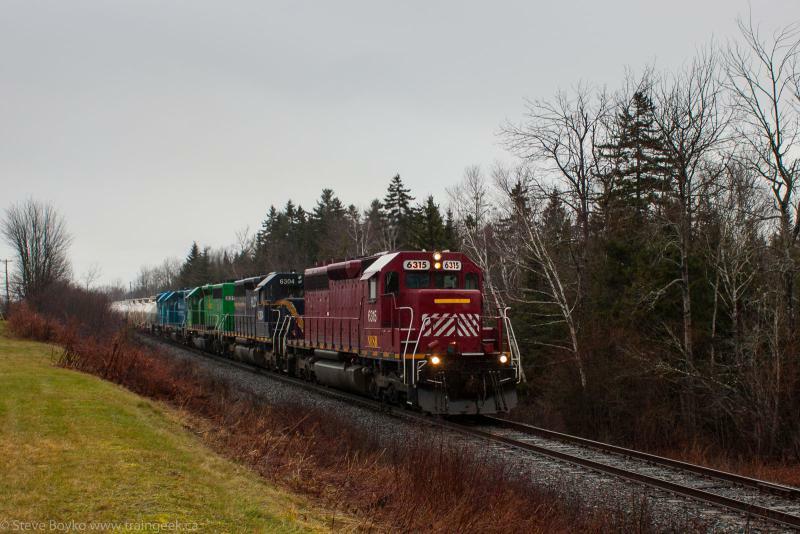 I grabbed a quick side-of-road shot as the train passed through Grand Bay. 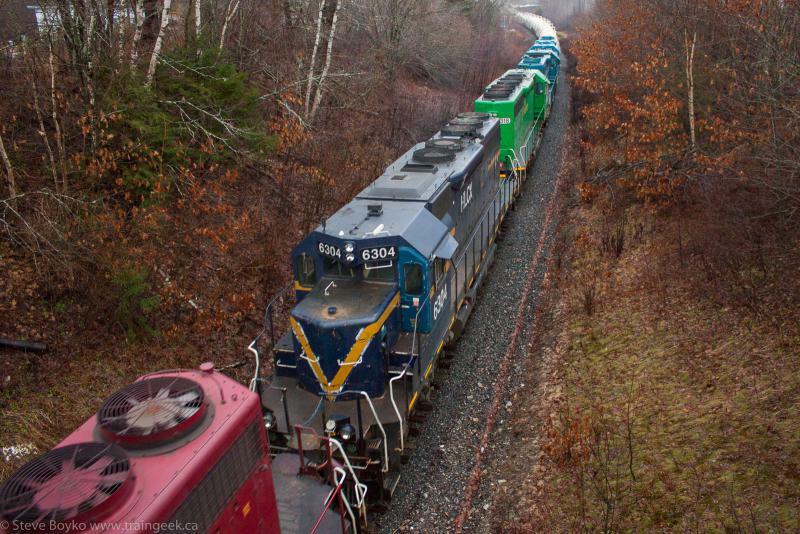 Since I had an overhead shot I felt no need to get the overhead shot by the Co-Op, and the train was there first anyway. I had no real idea of what I wanted next except that I wanted the bridge shot just before Gault Road. I stopped to take this photo at Ketepec Road. The engineer really loved that horn and 6315 has a very loud horn! Here's the bridge shot I wanted. As you can see it was raining by this time, but whatever... The nice thing about a heavily overcast day like this is that you can shoot from any direction and the light is pretty much the same! I had to do some serious editing to lighten the pond and engines enough to be seen, yet not blow out the bright sky. I went to the overpass to shoot them coming into the yard. "Huff and Puff" were working the west end. 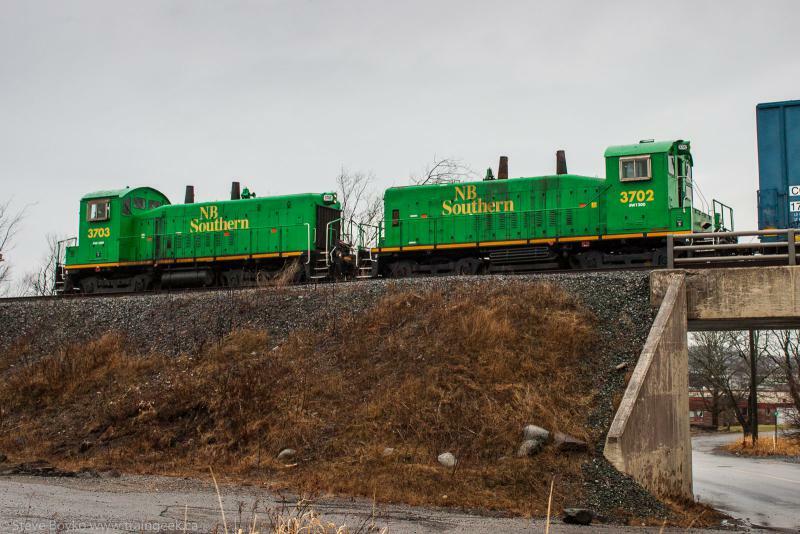 These are NB Southern's two SW1200 locomotives. 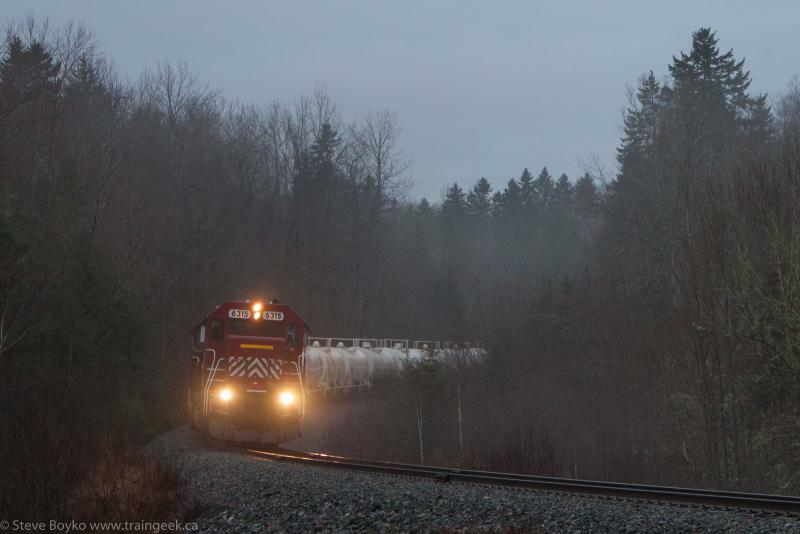 The eastbound freight stopped for a while. I am not sure why but there was some chatter about a freight car. Eventually they got started again.. very slowly. I imagine the rails were quite slippery with the rain and it was hard to get started up the grade into the yard. The engines sounded great and the sanders were doing their thing. It's been a very long time since I chased an NB Southern train! 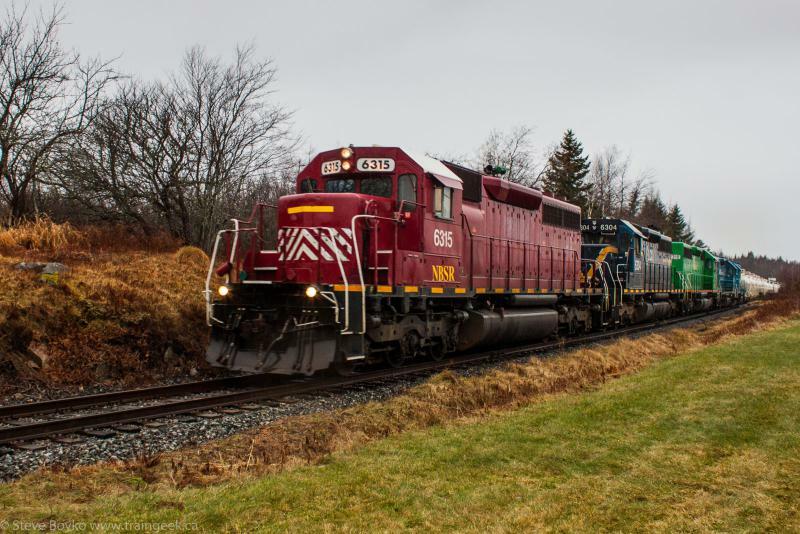 Thanks to Brian for the heads up and the rest of the RailsNB group for all the information they provide. Those are some great angles of a cool looking line! Thanks, Karl! I know that section of track very well and I'm glad I remembered the "good spots".